Unsanctioned rallies on Moscow’s Triumph Square on December 31 will be suppressed, according to the deputy head of the Moscow police, Vyacheslav Kozlov. ­Opposition leader Eduard Limonov has not been given permission to hold a rally involving 1,500 people, although it may have been sanctioned for earlier in the day. The rally is in support of Article 31 of the constitution, which grants freedom of assembly. 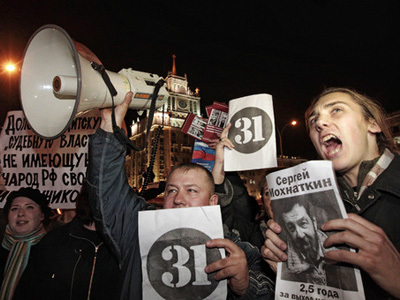 Despite the refusal, Limonov and his supporters still intend to come to the square. At the same time, Moscow authorities sanctioned another gathering of about 1,000 people. The rally, scheduled for 6pm on December 31, is organized by human rights activist Lyudmila Alekseeva, the head of the Moscow Helsinki Group, and her supporters. As Vyacheslav Kozlov explained, they got two requests to hold a rally at the same place at the same time. As the Moscow Helsinki Group was given permission for a gathering at 6pm, authorities suggested Limonov’s supporters gather on Triumph Square in the morning. This proposal, however, was rejected. “They purposely do everything so that police detain them,” Kozlov said on Wednesday, adding that Moscow police do their best not to allow unauthorized gatherings.